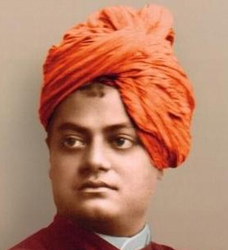 Swami Vivekananda was a spiritual leader, yogi and patriot from West Bengal. He was one of the prominent leaders of the Indian religious and cultural renaissance. The real name of Vivekananda was Narendranath Dutta. He was born on 12th January, 1863 in Calcutta. He was Ramkrishna Paramahamsa's disciple. In 1893, he went to Chicago as a representative of India at the Parliament of All Religions of the World. On 11th September, he delivered his historical speech which made his learned audience bow their heads in reverence. In fact, he was the first person who made India's greatness known to the world. IN 1897, he founded Ramakrishna Mission for the service of the Indian Society. Vivekananda showed a new path to the younger generation, through his books like' Yoga', 'Rajyoga' and 'Gyanyoga'. Swami Vivekananda memorial built at Kanya Kumari tells us even today the story of the greatness of Vivekananda.